Today we examine a 2009 merlot from Washington State that costs $9 at Costco. OK Washington merlot has a reputation. That being, it is generally on the sweeter side. It’s a good choice if you want to bring a white wine drinker over to the dark side. 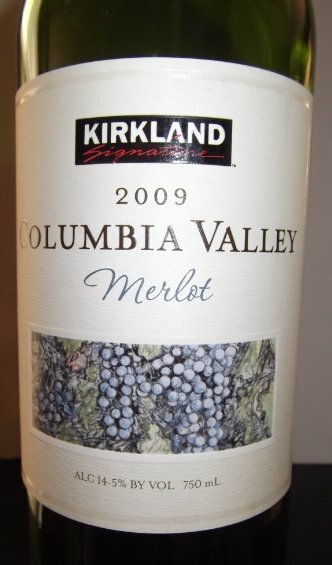 Kirkland Signature Columbia Valley merlot falls right in line with that reputation. And, it’s pretty good: soft, medium-bodied, and pleasant. Warm blackberries, with spicy chocolate. It’s great for a party — most people will be happy to sip it, and it’s a conversation starter, as in: who knew that such a “bargain brand” could taste this good? (Idiot wine snobs may talk behind your back, as if you brought some wine that you found at a gas station. Screw ’em.) It’s got some mouth-drying tannins, but it mostly soothes you with vague deep, dark fruit flavors. It does almost nothing wrong. Hi! Today we review another Mark West pinot noir, a California red wine that costs around $20 a bottle. Bottom line: A yummy pinot, but at $20, not recommended. OK folks, I’ll keep this short. You’re forgiven if you’re thinking. “Hey Wineguider, shut up already about Mark West! !” — this is the 3rd I’ve reviewed — but I have good reason for my focus on them: that amazing 2008 $9 pinot with the orange label. This $20 pinot is also good, although its label is beige: it’s fruity, it’s a bit minerally, and it’s balanced. It tastes like real pinot noir. And it’s a beautiful ruby red color. However, it doesn’t have serious depth or strength of flavor, and doesn’t have a lot of complexity. At $20, I start to expect these things. Another problem: I enjoyed it with a spinach salad that included hard boiled eggs and bleu cheese, and honestly, the salad overwhelmed the wine. Today we review a California chardonnay from Napa Valley that costs about $20 a bottle. Bottom line: Recommended for those who like buttery, oaky chardonnay. Did I mention buttery? OK I have a confession: I have something against most California chardonnays. That being, I hardly ever like them. The ones that are remotely affordable are usually way too oaky and they feel sort of clogged, flavor-wise. Clogged with what? I don’t know — strange, artificial-tasting flavors. Now, for a ray of hope. Today’s chardonnay is a bit different: it’s extremely buttery, and yes it’s pretty darn oaky, but it’s not overwhelmed with those weird, fake flavors I was mentioning. So despite my bigoted prejudice, I think William Hill chardonnay from Napa Valley is actually pretty darn good. And I’m really glad that the winery sent me this sample to check out. The downside? It’s not crisp or refreshing, because there is so much deep, intense flavor. And yet, it doesn’t do anything really wrong. For $20, that’s special. As for the Wine Review Tasting Notes — you know, “braised honeydew melon with hints of duck taco” — they aren’t that important here, because William Hill tastes similar to every other decent California chardonnay, with its flavors presented in a way that feels more natural, and less weird to your Wineguider. But two other things stand out: it’s a little bit minerally, and it’s a bit spicy. Yum. More William Hill, please? Today we review a $10 red wine from California. Bottom line: This one doesn’t taste bad, but it’s not good enough to recommend. Uh oh. OK folks, this will be quick. Grayson Cellars 2009 cabernet sauvignon tastes OK, but it’s too sweet, kind of generic, and it doesn’t really taste like a cabernet sauvignon. The reason for the “uh oh” — it tastes similar to their pinot noir, which your Wineguider recommended. So it makes me wonder if THAT wine also tasted too sweet and generic to recommend. I mean, a pinot noir that tastes similar to the same winemaker’s cabernet? Really? You’re recommending that? Well, uhh. . . yeah, I think. I mean, it wasn’t the DEFINITION of pinot noir, but it was pretty close. And yeah, it was a little generic and sweet… but it was OK! I’m pretty sure! Oh well. At least we have clarity for today’s review: the 2009 Grayson Cellars cabernet sauvignon is a no-go. Although it’s easy-drinking and not bad by any means, it just isn’t dry enough, “cabernet” enough, or delicious enough to recommend.